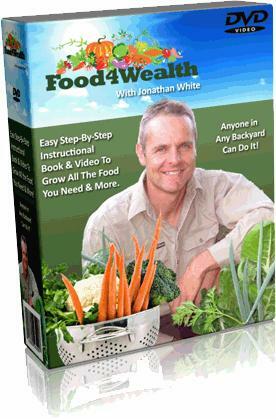 On the last day of 2010, I want to talk about getting more from your garden next season. Even in a cold climate extending the garden season beyond what most people think is possible is very feasible. And you can do this without breaking the bank. It's mostly a matter of some smart choices, supplemented with a little appropriate technology. FYI I'm in Canadian hardiness zone 5, roughly equivalent to U.S. Hardiness zone 4; here's how we eat from our garden 12 months of the year. First let me clarify there's the garden growing season and then there's the eating-from-the-garden season. Let's talk about extending the growing season first. These techniques have passed the test of practicality; there's no point in spending more than the value of the produce itself to stretch out the growing a bit. Extending the garden season begins with careful site selection. This is the easiest and cheapest way to get more sooner from your garden. My garden sites have been chosen for their 'micro-climates'. I have a 'sunny garden' and a 'shady garden'. The shady garden has trees to the south and east; its a good spot for mid-summer lettuces and greens that don't appreciate the full summer sun. This garden also slopes slightly to the south-east. Always be aware of the slope of your garden because cold air and frost can 'pool' in low-lying areas. Extending the garden season with careful crop selection. This might seem obvious, but to harvest crops early, you have to pick a cultivar that will 1 – germinate in cool soil, and 2 – has a shorter 'days to maturity'. Your seed catalog usually has this information. Here's an example; I grow a bush bean called 'Provider'; it's a dark-seeded bush bean. Dark-seeded bush beans germinate better in cool soil than light-seeded cultivars. I can plant Provider a couple weeks earlier than other beans I grow. Provider also has a fairly short days to maturity, making it a great bean for the early market. I can also plant it here in mid-summer and get a crop in about 6 weeks. This makes it a good fall bean, too. Which brings me to extending the garden season by staggering planting dates. We plant many cultivars every two weeks throughout the season. We get in the outdoor garden in mid-April most years. We keep planting some crops right up until mid-September. 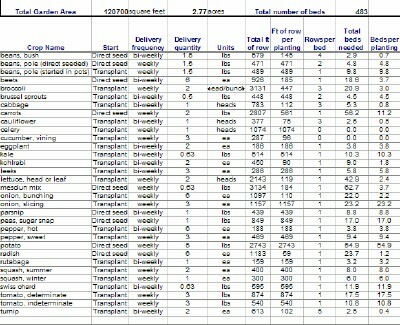 This takes a bit of planning to make sure your choice of crops will have time to mature; spreadsheets are great tools for this. Extending the garden season with transplants. If you grow where I do, transplants are absolutely necessary to have a reasonable growing season. The first year we operated our CSA, we started all our transplants on two home-made light stands in our living room! We built the light stands from 2 x 2 lumber and used cheap florescent shop lights to grow the plants. We put the lights on timers, 14 hours on and 10 off. Each stand, which cost us about $150 including the light, could hold 16 trays of seedlings. We had 16 families in our CSA that year. Some of the money from that first garden paid for my plant starting room and my first little lean-to greenhouse. This greatly extended the number of transplants we could grow. But anybody could start with two plant stands like ours, for very little money. Extending the garden season with the gardener's “secret weapon” – row cover. I love row cover; you can probably tell that from the photo above. It is probably the single most useful 'tool' for the small organic grower. Row cover lets me start planting in my outdoor garden a full month before last frost. Row cover lets me put plants out without having to harden them off. This is gardening heresy, I know, but I have never lost a spring plant to cold under row cover. And row cover provides the windbreak that is missing from my sunny garden. I believe early crops are more damaged by wind than cold. And, row cover is a physical barrier against insect pests as well; I couldn't grow brassicas without it. Extending the garden season with film mulch. I use a plastic sheet film mulch in my garden to warm up the soil for the earliest crops and to keep down weeds. 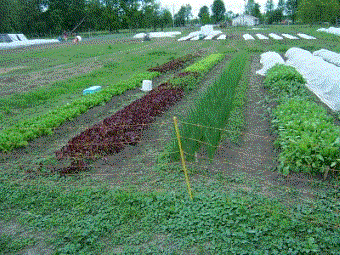 Plastic mulch paired with row cover can produce crops weeks earlier than the unprotected garden. Placing drip hose under the mulch film makes watering easy. The only problem with the mulch is picking it up when the season is over. However with careful planning the plastic mulch can remain place for 2 seasons; just pull out the residue plant stalks in the fall, and plant a different crop in the spring. Note that the plastic mulch film can be recycled, although not all facilities accept it. Extending the garden season with a poly tunnel. My unheated high tunnel poly hoophouse is a source of great satisfaction for me. Last season I started working in there at the end of February! 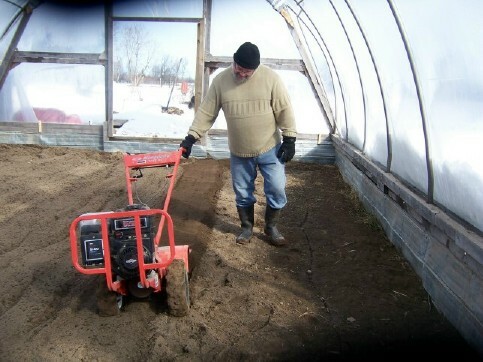 There was still snow on the ground outside when I planted the first crops at the beginning of March. And the hoophouse also helped me produce many thousands of transplants, as well as bedding plants for sale. Extending the garden season in a hoophouse works at the other end of the calendar, too. If you build a movable hoophouse like mine, you can greatly extend your fall harvest as well. I believe it will be ultimately possible for me to harvest from my hoophouse for 9 or 10 months of the year. As I mentioned, the growing season and the eating season don't necessarily coincide. When the growing is done, I still have storage vegetables in my cool room – rutabaga, potatoes, carrots, garlic, onions – as well as some pickled and frozen selections. These things will last me until new crops come in the spring. By the way, my cool room used to be my old plant-starting room. This was a 10-foot by 12-foot heavily-insulated 'box within a box' I built in one of my outbuildings, and fitted up with plant stands and grow lights. Then a couple years ago, when I built a bigger and better plant starting room; the old room became my walk-in cooler for summer harvests, and my cold storage room in the winter. A room air conditioner cools the room in the summer, and a baseboard electrical heater keeps it from freezing in the winter. It was another great investment that I use 12 months a year. So, am I growing a complete year-round diet? No, but as I learn more about extending the garden season I am getting closer to that goal. The point is I can meet at least part of my food needs from my garden 12 months a year. I also have a couple freezers (outside, of course) full of my own organic free-range chicken and pork. And all this was accomplished without a huge investment upfront; we really did 'bootstrap' our way to where we are now. I hope this gives you some ideas and inspiration for your garden next season. Have a great 2011, grow some great food, and find a little joy in your garden.